Shore Excursions From Livorno to Florence Include: Our shore excursions from Livorno to Florence include private “driving guide”, reservation fee and tickets to Accademia museum. NOTE: Additional cost for tickets may apply if museum has special exhibits. Accademia Museum Closings: Mondays, New Year’s Day, May 1st and Christmas Day. Let Well Arranged Travel take you on a private tour to Florence, a shore excursion from Livorno for small group tours of 1 to 8 people or larger groups, any size. 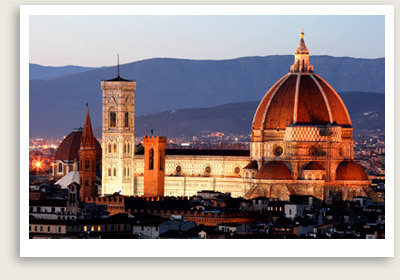 Your private shore excursion to Florence from Livorno may be customized to suite your goals. When you arrive your walking tour of Florence will include a stop at the Accademia museum. You will explore Florence, the birthplace of the Renaissance, with your tour guide for the day. Florence, a 2,000-year-old city, has an amazing history and some of the world’s greatest art and architecture. During your walking tour of Florence with your tour guide, you will stroll through the city’s treasures: Renaissance palaces, beautiful piazzas, markets and famous shopping streets. In this private tour of Florence, you will get a glimpse of the famous art works at the Duomo (Cathedral) as well as Brunelleschi’s Dome. You will also see such famous landmarks as the Baptistry’s Gates of Paradise, Bell Tower, Ponte Vecchio, Vasari’s Corridor and Medieval towers. In your private tour of Florence with a local guide (optional), you’ll also hear about the history of Florence and its famous rulers and artists. Before returning to Livorno, your shore excursion to Florence will also take you to the Galleria dell’ Accademia museum, home to a few of Michelangelo’s amazing works, including the Statue of David. The museum’s collection also includes many gems from the Florentine Gothic, Baroque and Renaissance periods. PLEASE NOTE THAT THE SHORE EXCURSIONS YOU SEE ON OUR WEBSITE ARE JUST SAMPLES OF THE PRIVATE TOURS FROM LIVORNO THAT ARE AVAILABLE TO YOU. WE CUSTOMIZE TOURS FOR PRIVATE GROUPS, COUPLES AND FAMILIES. JUST LET US KNOW WHAT YOU HAVE IN MIND.